I didn’t think the girls and I would have much to do in the little village of Mae La Oop while Rand’s students were doing their internship. The whole town consisted of a couple dozen wooden houses on the side of a hill, a church, a Buddhist temple, a school, and a hospital. No restaurants. No stores (unless you count a few little shops run out of people’s homes that sold an assortment of snacks). And the wifi was sporadic at best. So we were excited when we were not only invited to go to the school with the students to help teach English, we were also asked to teach our host’s family in the evenings. 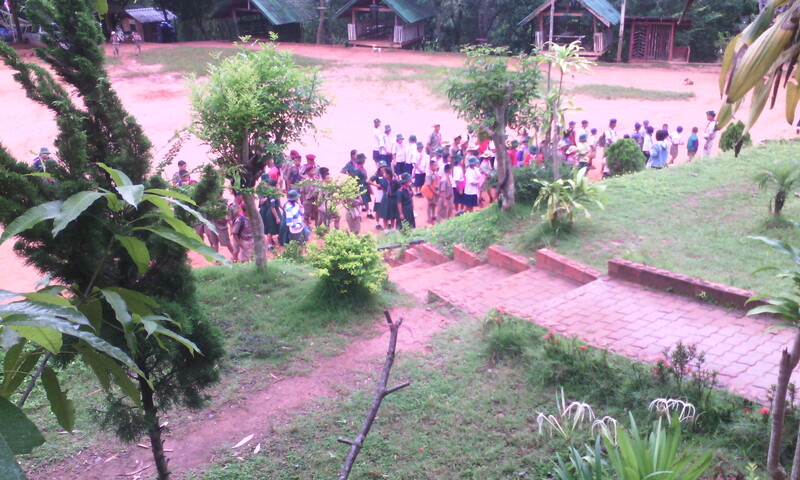 When morning came for us to go to the school, we climbed up the hill on the dirt road, everyone complaining about the steep incline while simultaneously realizing that the local kids do this every day. At the top of the hill stood the school which consisted of small wooden buildings used as classrooms encircling a large dirt field. When we arrived several groups of children were running around or kicking a ball in the center area. When it was time for classes to start the students lined up in front of the flag poles at the top of the circle before proceeding to their classrooms. Rand’s students were each assigned to a class. Rand and the girls and I decided to help with the younger kids. We were led to a classroom with brightly colored desks. At each desk sat an adorable child with dark hair and matching school uniform looking at us expectantly. We hadn’t been given information ahead of time so we were just winging it. We attempted to introduce ourselves in Thai. Then the student teacher asked their regular teacher what the kids were learning. 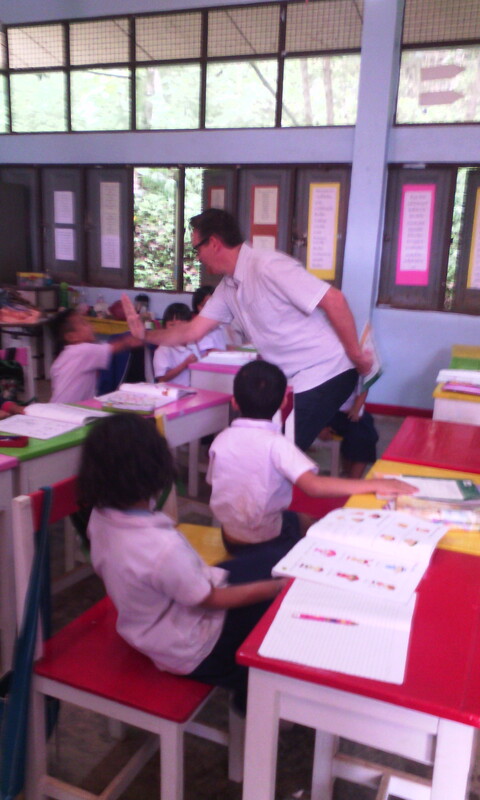 Luckily, this student teacher speaks Thai, so he was able to explain how to play. The kids understood . . . sort of. We even had one of the kids take a turn as Simon (or Teacher as we called him because Thai kids have no idea what a “Simon” is). The next day I helped in a class with older students. One of the girls had very good English and asked me if I had been to Bangkok and if I knew any football players. She meant soccer, of course, and I had to tell her that I did not know any players. But, yes, I had been to Bangkok. It was nice to be able to communicate with someone from the village with more than just gestures and the few Thai or English words we both knew. 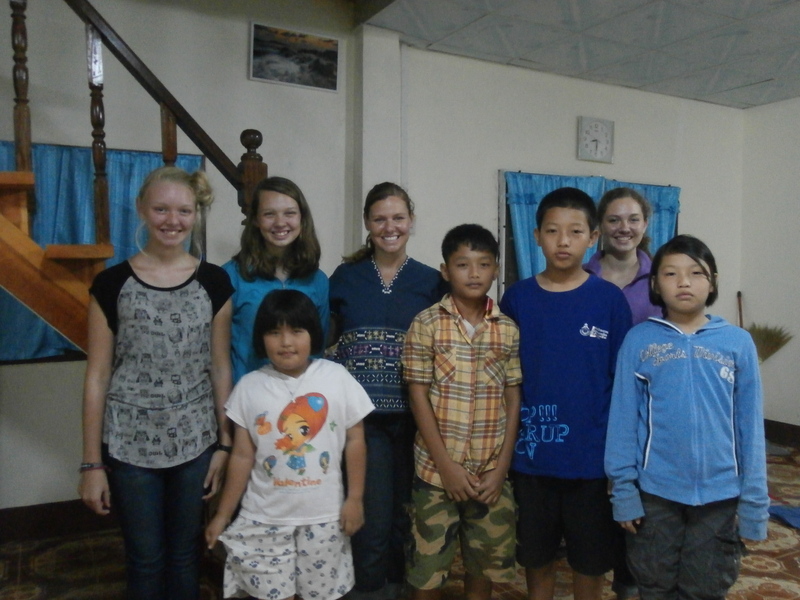 The girls and I taught our homestay family’s nine year old daughter and some of her cousins. Each day we would come up with new concepts to teach and reviews previous words and phrases. We taught colors and animals, sang songs like, “Head, Shoulders, Knees, and Toes” and practiced asking and answering questions. 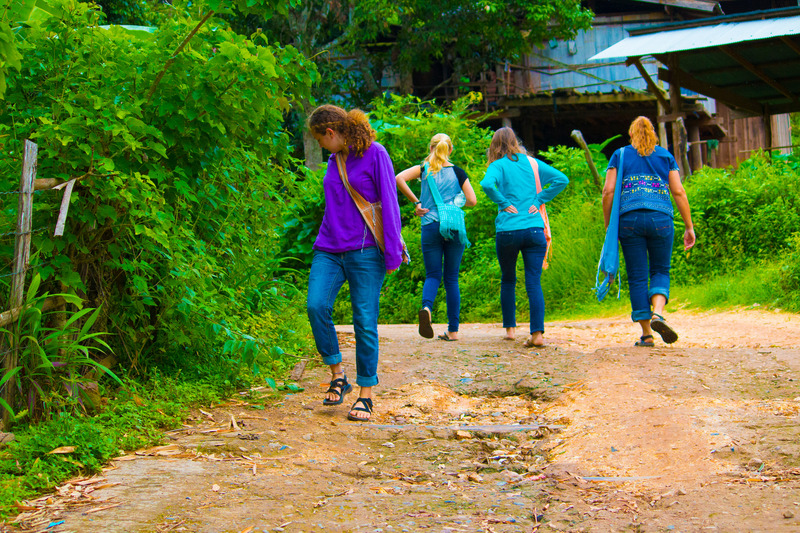 When we first arrived in Mae La Oop, I thought the girls and I would just be hanging out not doing much, but instead we got to help the local people. It doesn’t seem like much and we were only there a short time. But I am glad that we were able to help in this small way.